When the air grows cooler and we begin to pull out our warmer winter clothes, it’s nice to have a pair of toasty, interesting socks to display – like these boot slipper socks comprised of granny square hexagons. With only six hexagons and a sole needed for each foot, this easy pattern is sure to warm your toes in no time! You’ll need to choose three complimentary colors of worsted weight acrylic yarn (Red Heart is suggested, as it is stiffer) – you could crochet a pair of holiday-colored socks, or choose your favorite colors, or even decide on one color and pick three shades. From there you’ll need to determine your size in order to find out which hook will suit. If you’re a small, you’ll need an “F” hook, a medium will be a “G” hook, an “H” will make a large pair of sock slippers, and “I” will result in an extra large. There aren’t too many complicated stitches (mostly basic stitches such as sl st, sc, dc, and trc), though the free pattern does walk through a few yarn over and front/back loop stitches. It should be noted that there is some assembly required, as the hexagons and sole, once complete, will either need to be crocheted or sewn together (if sewing, remember you will need a pair of scissors and a tapestry needle). This pattern is still labeled “Easy”, however, because it is worked flat and then assembled. 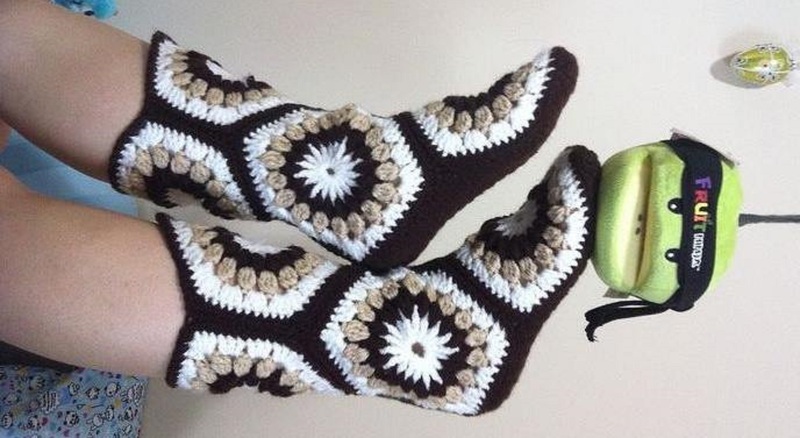 If you’d like to try your hand at a pair of these swingin’ sock slippers, you can find the instructions on the Free Pattern page at Priscilla’s Crochet.